Lance Keimig and I have been talking a good bit about the history of light painting over the last few months in preparation for Lance’s new book. 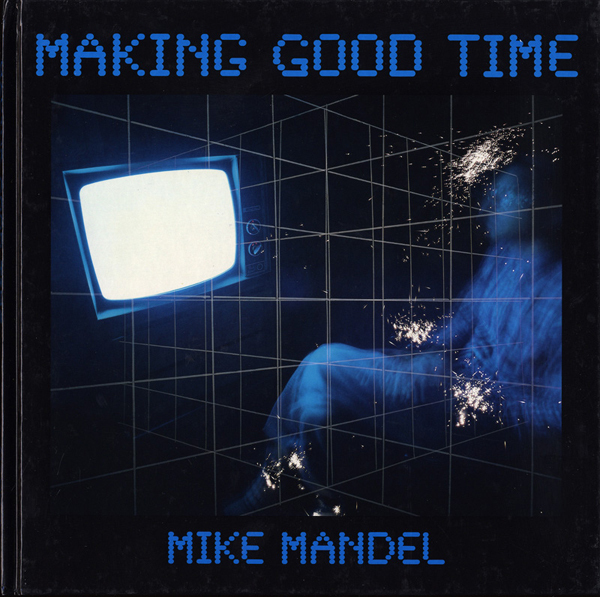 During one of our discussions Lance brought up Mike Mandel and his own book “Making Good Time”. I said HUH?!? 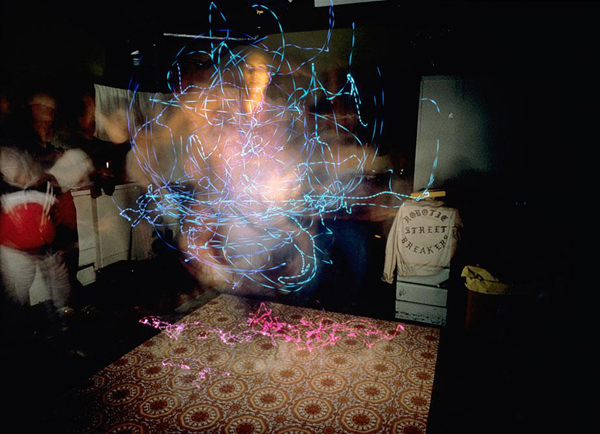 I had never heard of this, I am as big a light painting history nerd as your gonna find so immediately I ordered it online and when I opened it up for the first time I was absolutely blown away. Not only were there stunning and historical light painting images that I had never seen before but there is also a significant amount of research that Mike had compiled about the history of early light painting photography pioneers Marey, Gilbreth, and a few others that you should read about when you order “Making Good Time”. 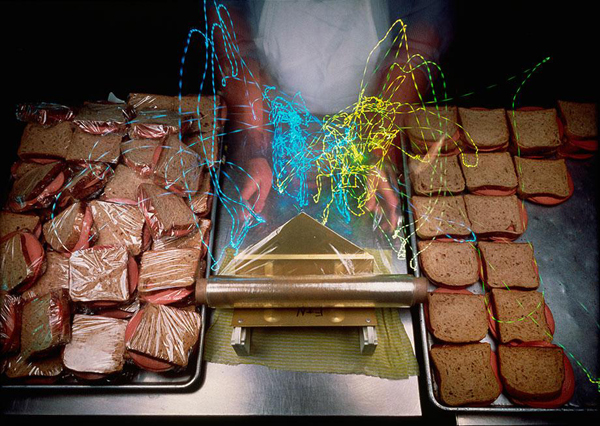 Mike Mandel’s light painting photography work is an extension of the Work Simplification studies, or Chroncyclegraphs, of Frank and Lillian Gilbreth but “They were made as a satire, examining daily life tasks that didn’t need to be analyzed for efficiency’s sake”. Check out some of these awesome images below, read the short interview I did with Mike, and most importantly add this incredible book to your collection. LPP ∇ Mike thank you very much for taking the time to answer a few questions. Can you tell me a little about yourself, your background, and specifically how did you get involved with photography? MM ∇ I became interested in photography in the early 70s when a lot of people of my generation were looking for something more meaningful and creative to devote themselves to. I got a MFA from the San Francisco Art Institute in 1974 where I met Larry Sultan. He and I collaborated on numerous projects over the next 27 years including an important photographic book Evidence that we self-published in 1977. 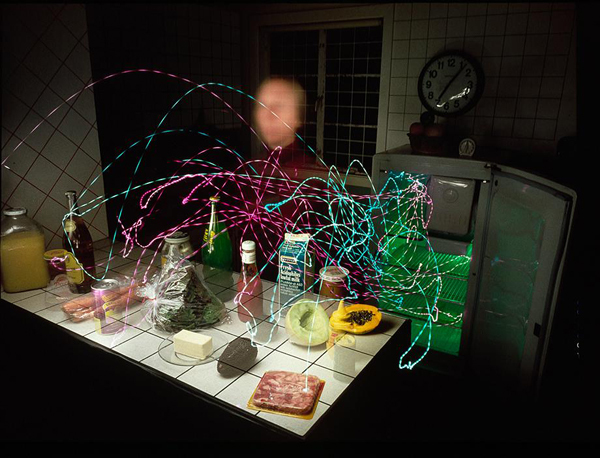 LPP ∇ Your light drawing work was heavily influenced by the Gilbreth’s can you talk a little about that? What was the image that created that initial spark for you to seat creating your light drawings and how did you happen upon it? MM ∇ Before I discovered the Gilbreths I happened upon a 1950s high school textbook pair of images of a woman wearing lights on her wrists. 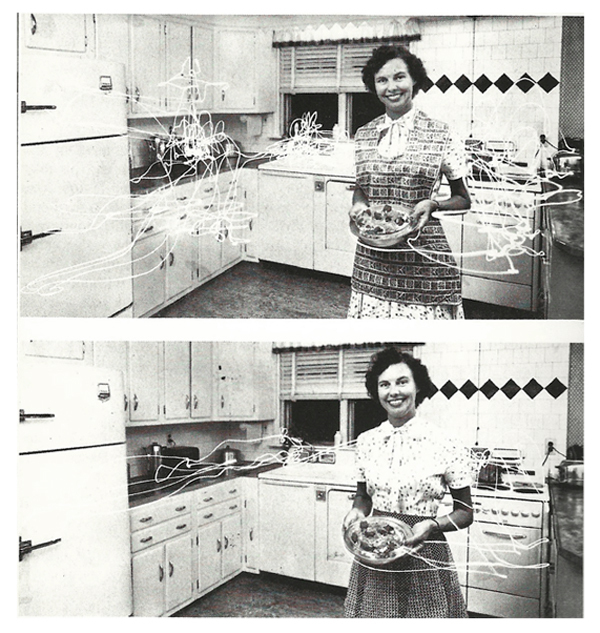 The images depicted a long time exposure in very low light of the woman making dinner from scratch ingredients, and the other making dinner from frozen ingredients. The light patterns from frozen were obviously less, thus “proving” that frozen food preparation was “scientifically” more efficient. The whole idea seemed so amazingly insane that I needed to find out if there was a history to this “time-motion” photography. In my research I came upon Frank and Lillian Gilbreth who were using this photographic technique to create their “chronocyclegraphs.” Just past the turn of the 20th century when work in the factory was just beginning to be studied and rationalized, people like the Gilbreths and Frederick Winslow Taylor were trying to figure out how to make people more efficient in their work methods. Photography was employed in this manner to teach people “the one best way” to accomplish a work method. LPP ∇ Let me backtrack a minute how do you classify your light drawing images? Do you call them light drawings or something else. MM ∇ My images were directly in response to the Gilbreth’s Chroncyclegraphs. 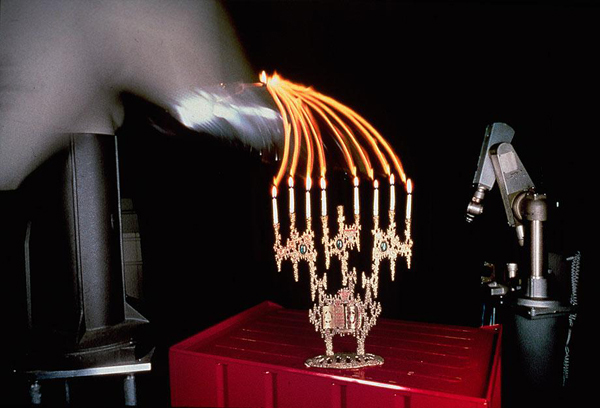 They were made as a satire, examining daily life tasks that didn’t need to be analyzed for efficiency’s sake, but were made to suggest that this emphasis on efficiency was a kind of sickness in our faith in science and technology to provide a framework for how we envision our lives. LPP ∇ I know that your childhood travels with your father also had a heavy influence on your work and specifically the title of your book “Making Good Time”. 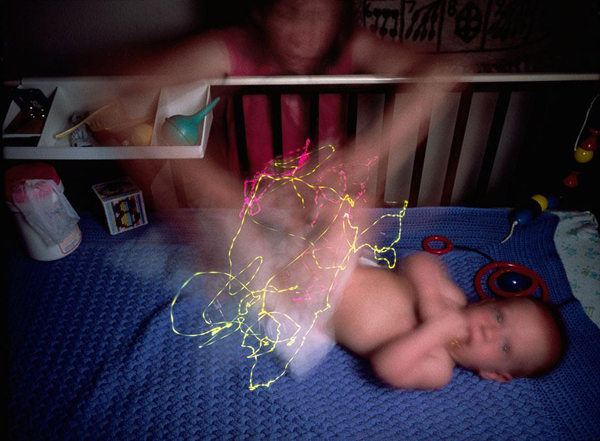 Do you feel those early years helped steer your work with light in the direction it took? MM ∇ “Efficiency” is a value that was certainly imbued in my parents’ generation. When the family got in the car to visit my grandmother who lived in Los Angeles (we lived in the suburbs of the San Fernando Valley) my father would always be proud to say that we were “making good time” when there was no traffic on the Hollywood Freeway. This idea of “making good time” stuck with me, and as I evolved into an adult it seemed like a value that symbolized so much that was wrong with society. Efficiency was the last thing on my list. I wanted a life that had meaning and that could provide answers to larger questions. LPP ∇ Did your work with light always revolve around time and efficiency or did you ever travel down another path? MM ∇ This was a specific project. It took me about ten years to figure out exactly what I was up to. I guess I wasn’t too efficient about it, but that was just fine. My son was born somewhere in the middle of this, and of course that helped to stretch out the work. But the longer you work on idea, the clearer everything becomes in the end. 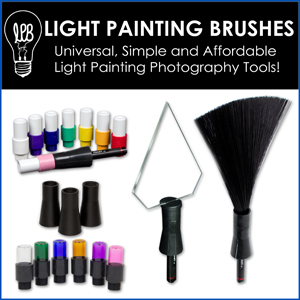 LPP ∇ What was the first light drawing you created? MM ∇ I don’t know about the first, but one of the early memorable ones was when I had yet to work out the technology and was using a motorcycle battery with bulbs attached to wires. My wife wore the battery in a backpack and had the wires strung through her clothing. We took this to a club and she was dancing with the lights, which was pretty beautiful, until the wires short circuited and I had to quickly disengage the batter before she became burned. That was scary and led me to work with a friend who figure out how to re-configure those little bicycle lights that blink. He figured out how to make the lamps blink at a much faster rate, about 20 times/second, which came close to what the Gilbreths were doing. The faster the motion the longer distance between blinks, the lower, the closer. This is how the Gilbreths could identify when people speeded up or slowed down in their work method. And it was just what I needed to make a direct comment about their work. 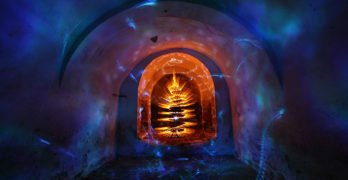 LPP ∇ Which light drawing image was the most difficult? MM ∇ Emptying the Fridge. There’s the drawing of light with the small units I just described, but there’s also additional light that I would shine from a flood lamp to create the illusions I was looking for. This was quite a challenge, and thankfully I had a polaroid back for my 4 x 5 camera that helped me figure out how it was working. I was shooting 4 x 5 transparency film, so there was little room for error in exposure. 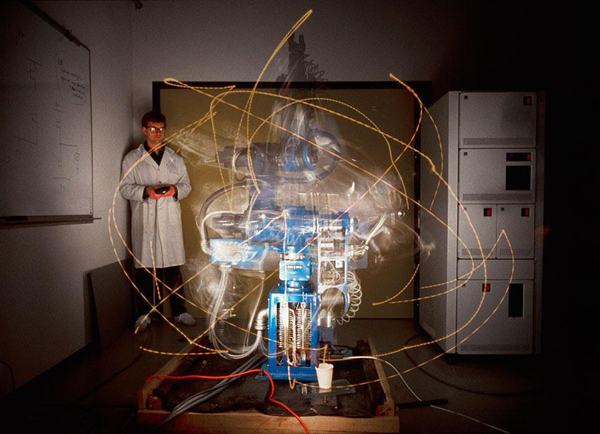 LPP ∇ What inspired you to start working with robotics? MM ∇ The robot seemed to be the logical extension of what the Gilbreth’s were up to: taking the repeatable motions and making them as efficient as could be, which the robot does very well. 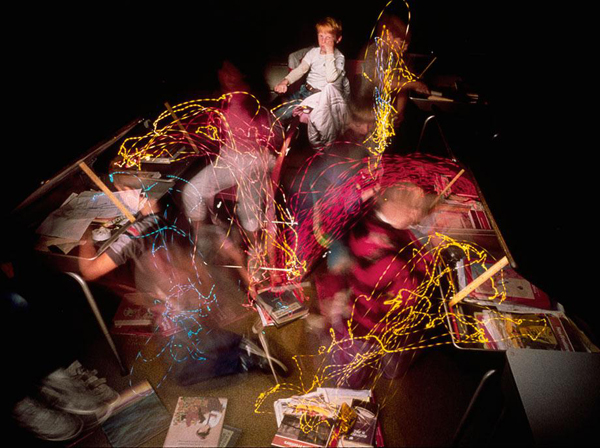 LPP ∇ What was the most interesting thing that you learned from creating your light drawings? MM ∇ I learned how the artists of the time (during the early part of the twentieth century) were using light and especially motion as symbols of the new technologies that were being invented to speed up everyday life from work to the mundane activities of housework. And at the same time social engineers like the Gilbreths were using similar visual strategies to actually change how people worked and lived. Standing apart from this history a few generations later I learned how to see these images in a way that only one could see after mechanization took command and changed human behavior so dramatically, not necessarily to the good. LPP ∇ Do you still create and light drawings or is that a chapter of your life that has been closed? MM ∇ This was a project that last quite a while. When it was done, it was done. LPP ∇ One final question, Do you follow the current light painting movement and if so what do you think about the evolution of the art form? MM ∇ Sorry to say, I’m not following this movement, so can’t really comment. But of course I wish everyone who is committed to their work and ideas, great success and enjoyment. LPP ∇ Thank you again for taking the time to answer some question, for your inspiring work, and for the early LP history that you included in your book it really is a gift to the community. To see what Mike is up to now check out his Flickr page HERE or to get a MINT signed version of “Making Good Time” for 50 bucks +5 bucks for shipping email him at mike@thecorner.net.